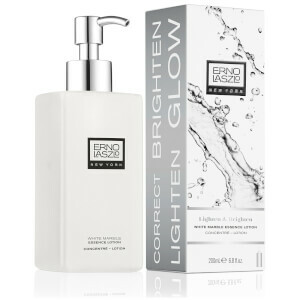 Unveil glowing skin with the Erno Laszlo White Marble Essence Lotion; a brightening toner that is an essential step in your bespoke cleansing regime to target discolouration, hyperpigmentation and uneven tones. Lightweight yet powerful, the liquid-textured formula works to rehydrate and firm with natural moisture-magnet Glycerin, while extract of Comfrey Root stimulates cell renewal and repairs for a visible plumping effect. The addition of Vitamin C strengthens skin's protective barrier and enhances brightening effects, while Daisy extract helps combat age spots and lighten the appearance of pigmentation for a more refined and balanced-looking complexion. Lemon Peel Oil removes dulling dead skin, and Shea Butter nourishes and exfoliates to reveal a soft, supple complexion. Suitable for daily use, skin feels refreshed and revitalised with a lit-from-within radiance. Free from phthalates, petrolatum, sulphates and mineral oil.